Eyes: Close the eyelids. Press the eyes up gently and focus at the Brow Point (the top of the nose where the eyebrows meet). 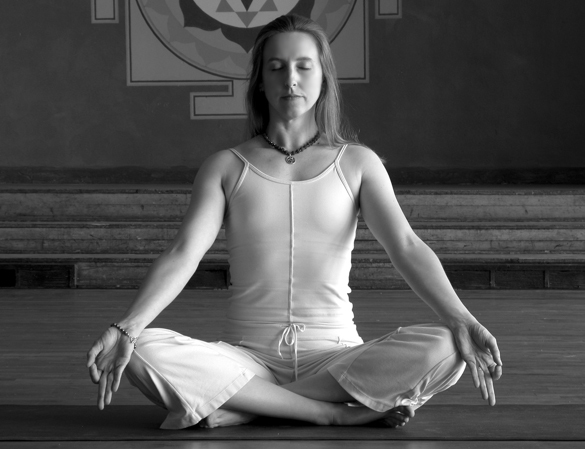 Calming Breath/Left Nostril Breathing: Sit in Easy Pose. Rest the left hand in Gyan Mudra (touch the tip of the thumb with the tip of the index finger). The left arm is straight on the left knee. Raise the right hand in front of the face with the palm flat facing to the left. The fingers of the hand are together and point straight up. Press the side of the thumb on the right nostril to gently close it. Begin long, deep, complete yogic breaths through the left nostril. Inhale and exhale only through the left nostril. Continue for 3 minutes. Inhale and hold comfortably for 10-30 seconds, exhale and relax. Energising Breath/Right Nostril Breathing: Sit in Easy Pose. Rest the right hand in Gyan Mudra. Raise the left hand in front of the face with the palm flat facing to the right. The fingers of the hand are together and point straight up. Press the side of the thumb on the left nostril to gently close it. Begin long, deep, complete yogic breaths through the right nostril. Inhale and exhale only through the right nostril. Continue for 3 minutes. Inhale and hold comfortably for 10-30 seconds, exhale and relax. Alternate Nostril Breathing: Sit in Easy Pose, with the spine relaxed and straight. Make Gyan Mudra with the left hand. Rest the left hand over the left knee. Close the eyelids. Press the eyes up gently and focus at the Brow Point (the top of the nose where the eyebrows meet). Block the right nostril with the thumb. Press just hard enough to close the nostril. Keep the rest of the fingers straight up. Inhale deeply through the left nostril. When the breath is full, bend the right hand into a "U" extending the little fingertip over to press on the left nostril. Close the left nostril and let the right nostril open by releasing the thumb pressure. (You can also use the thumb and index finger.) Exhale smoothly, and completely through the right nostril. When the breath is completely exhaled, begin the cycle again with the inhale through the left nostril. Continue for 3 minutes with long, deep, regular breaths. Inhale at the end and hold the breath for 10-30 seconds. Exhale and relax. Alternate Nostril Breathing: Repeat exercise #3, except use the left hand to direct the inhale through the right nostril and exhale through the left nostril. Breath of Fire: Sit in Easy Pose with both hands in Gyan Mudra. Begin a powerful, regular, and conscious Breath of Fire. Continue for 7 minutes. Then inhale and hold the breath for 10-60 seconds. Mentally watch the energy circulate through the entire body. Relax the breath and concentrate on the natural flow of the breath as life force for 3 minutes. Notice how your mind and emotions have changed. In the same posture, meditate. Inhale deeply and chant Long SAT NAAM’s. Continue 3-15 minutes. This set gives you a quick lift in energy, increased clarity, and a sense of balance. If you do the minimum times for each exercise, it only takes 22-25 minutes to completely reset yourself. It is an excellent set for beginners. You learn the relationship to the breath and you observe the differences in emotion and thinking that each type of breathing creates. Even though breathing is the most natural and essential thing we do, conscious breathing can be quite a challenge. When you alter the breath you begin to oppose and release the habitual patterns of emotion and attention that are coded in the habits of your body and mind. As those patterns begin to alter, you may drift in concentration or interest. If you continue and command the breath, then you will gain a new sense of ease and control where you direct your mind. This kriya is excellent to practice as a preparation for a more strenuous Kundalini Yoga set. It can be practiced in beginning and advanced stages. As a beginner, use the times listed above. For intermediate level practice, do exercises 1 through 4 for five minutes each. For an advanced practice, increase the times of 1 through 4 to a full 10 minutes each.